Candidates who have completed their study under 11+1 / 10+2 / 10+3 (10+Diploma) are only eligible for admission to any UG course in the School of Distance Education. B.Sc. Physics H.S.C. passed with Physics, Mathematics and Chemistry as subjects of study or Polytechnic Diploma. Direct admission to Second year of BCA / BSc Computer Science for relevant three years diploma in Computer Technology, Computer Engineering and Information Technology. Admission to II year UG for relevant Bachelor degree similar in nature For lateral entry programmes exemption will be granted only for the duration of the course as specified and for the same / similar subjects studied. For lateral entry programmes exemption will be granted only for the duration of the course as specified and for the same / similar subjects studied. Candidates who have completed their study under 11+1+3 / 10+2+3 /10+3 (Diploma) +3 are only eligible for admission to any PG course in the School of Distance Education. M.Sc. Information Technology A Pass in B.Sc. Computer Science/Computer Technology/Information Technology/Software Systems/Electronics/B.C.A. M.Sc Computer Science A pass in B.Sc. Computer Sciences / Computer Technology / Information Technology / Software Systems / Electronics / B.C.A. M.Sc. Bio-informatics Bachelor’s degree in any one of the following disciplines: Life Science / Chemical Sciences / Physical Sciences / Mathematics / Statistics / Veterinary Sciences / Fishery Sciences / Agricultural Sciences / Medical, Paramedical and Pharmaceutical Sciences /Food and Nutrition Sciences / Food Chemistry / Food Technology / Computer Science / Information Technology / B.Tech. Biotechnology / Forestry Science / Environmental Science. M.Sc. Environmental Science Any Bachelor degree in Science / Engineering / Medicine / Agriculture / Fisheries Science/ Veterinary Science. M.Com. Any graduate in B.Com./ B.B.M. /B.B.M. (CA) / B.B.A./ B.C.S. /B.C.S. (CA)/ B.Com.(CA)./B.Com. (e-Commerce) / Bank Management. M.Com. (Computer Application) Any graduate in B.Com./ B.B.M. /B.B.M. (CA) / B.B.A./ B.C.S. /B.C.S. (CA)/ B.Com.(CA)./B.Com. (e-Commerce) / Bank Management. M.A. English Literature A pass in B.A. English Literature or any graduate with part-II English in UG level (with four semesters). Admission to Second year MCA for relevant PG diploma in computer related subjects. Admission to Third year MCA for relevant Masters degree in computer related subjects. Click here for Application with Admission Regulations. The MBA Programmes designed by Bharathiar University are unique in nature with a variety of specializations. In addition to the regular MBA programme 13 MBA Programmes with a variety of specialization are offered. These MBA Programmes are job oriented, skill oriented and to broaden the talents of the individual, which will suit any organization. Expertise in information technology is the need of the hour. Moreover, any one specialised in computer related programmes is assured of lucrative jobs. The MCA course of Bharathiar University is designed in an extraordinary way, to help the students understand the subject very easily and score very good marks in the exams and the companies have highly rated the MCA programme of Bharathiar University. Candidates presently pursuing Master’s degree programmes in colleges are permitted to pursue concurrently these P.G. Diploma Courses as per eligibility requirement to widen their career prospects. Computer Applications A pass in any degree course. Bio- informatics Bachelor’s degree in any one of the following as one of the major subjects Agriculture, Applied Science, Animal Science, Bio-Chemistry, Biology, Bio-technology, Botany, Plant Biology and Plant Bio-technology, Chemistry, Computer Science, Computer Applications (BCA), Information Technology, Electronics, Environmental Science, Mathematics, Microbiology, Pharmacy Physics, Statistics, Veterinary Science and Zoology. Microbial Bio-Technology Pass in B.Sc. Degree in any Life Sciences such as Biology, Biochemistry, Polymer Chemistry, Chemistry with Biology Ancillary, Bio-Technology, Microbiology, Zoology, Botany, B.Sc. Plant Science, Plant Bio-Technology, Animal Science, Animal Bio-Technology, Industrial Chemistry, B.Pharm, Applied Microbiology, Medical Microbiology, Human Genetics, Medical Genetics, Molecular Biology, Genetics Technology, Environmental Sciences, Environmental Biotechnology, Genetics Engineering, Bio-informatics, Plant Biology and Plant Bio-Technology, Animal Cell and Biotechnology or Agriculture (or) B.E. or M.B.B.S. Fitness Management A pass in any degree course. International Business A pass in any degree course. Yoga Education A pass in any degree course. Educational Technology A pass in any degree course. Communicative English A pass in any degree course. Insurance Management A pass in any degree course. Export Management A pass in any degree course. 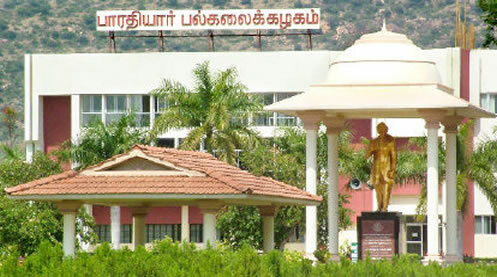 Bharathiar University has established unique and prestigious Study Centres/Spot Admission Centres to enroll students for various courses and Conduct Personal Contact Classes for both theory and practical in their premises by their experienced teachers. Personal Contact Class are arranged to cover the syllabus elaborately and to provide more and more computer oriented hands on training. Attendance at Personal Contact Programmes (PCP) is not compulsory, however for practical classes 50% attendance is compulsory.